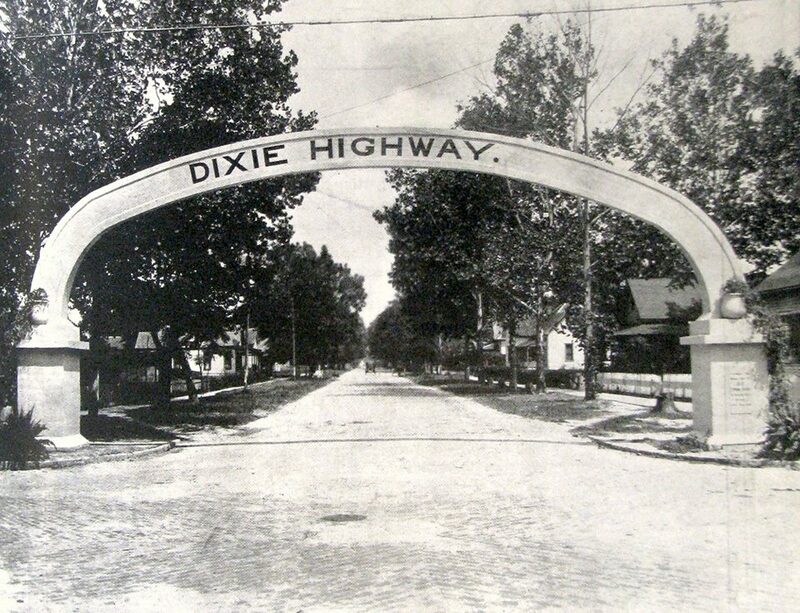 October 9, 1915 – Governor Edward Fitzsimmons Dunne, speechifying at nearly every stop, leads an intrepid band of travelers as they start off on the first day of the 1,500-mile drive on the new Dixie Highway. Twenty cars leave Chicago “for the land of orange blossoms, over the ceremonially virgin road.” [Chicago Daily Tribune, October 9, 1915] Short ceremonies are held in Grant Park as Juilia Stubblefield, representing Florida, and Lucille Finnegan, representing Illinois, lead a procession of girls representing the states in between, as they place flowers at the Fountain of the Great Lakes, “forming a floral highway, over which Miss Dixie and Miss Chicago crossed the waste of mud and mountains.” Governor Dunne says, “The main essentials for the future development of Illinois is the development of its highways and waterways. First in agricultural development, second in the production of wealth, third in population, political and commercial importance, Illinois is nevertheless lamentably behind in the development of its roads – twenty-third of all the states.” Representing Mayor Carter Thompson, Henry D. Miller, the city prosecutor, then leaves a letter intended for the mayor of Miami with the motorists. The first day’s drive ends in Danville, Illinois with a night’s rest there before the group continues on to Indianapolis. 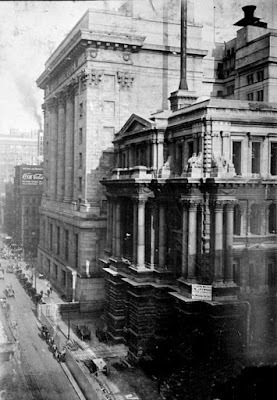 October 9, 1908 – The informal dedication of the new County Building on Clark Street between Washington and Randolph sees several thousand Chicagoans tour the new government building. The County Recorder’s office on the first floor has vases of flowers on each desk while “festoons of autumn leaves [are] draped from post and pillar.” [Chicago Daily Tribune, October 10, 1908] The County Clerk has a store of carnations for those passing through. County Board President Busse receives callers as they move through his offices on the fifth floor. Busse says at the end of the day, “First of all I wish to acknowledge the indebtedness of the county board to the people of Cook County for their constant and general support. No extras, no scandal, not even adverse criticism grew out of the work, and the cost of the building was kept within the contract price. 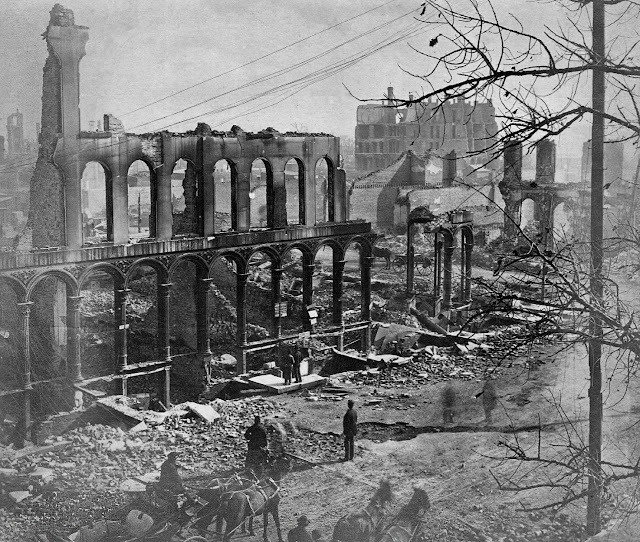 The cost per cubic foot was from 15 to 25 per cent less than that of some of Chicago’s notable buildings.” The Holabird and Roche designed building is one-half of the government complex, designed in the Beaux-Arts style, stretching from Clark Street halfway to La Salle. The Chicago City Hall, also designed by Holabird and Roche, is a near mirror image of the county building and sits west of the 1908 structure and is completed two years later. The County Building is pictured above with the old City Hall still standing to the west.